Visual Style Builder introduces a flexible and easy to understand system of property precedence rules. This allows you to fine tune the desired elements and eliminates the possibility of you asking yourself “Why am I getting this color here or there?”. 1. Default properties level. The properties at this level are shown by default in the property grid that you can see when you try to create a new repository item or in the property grid of the element itself. These properties can be overridden by any of the property levels that are listed below. Since these properties are default properties, they are not contained in the XML theme file that you save. 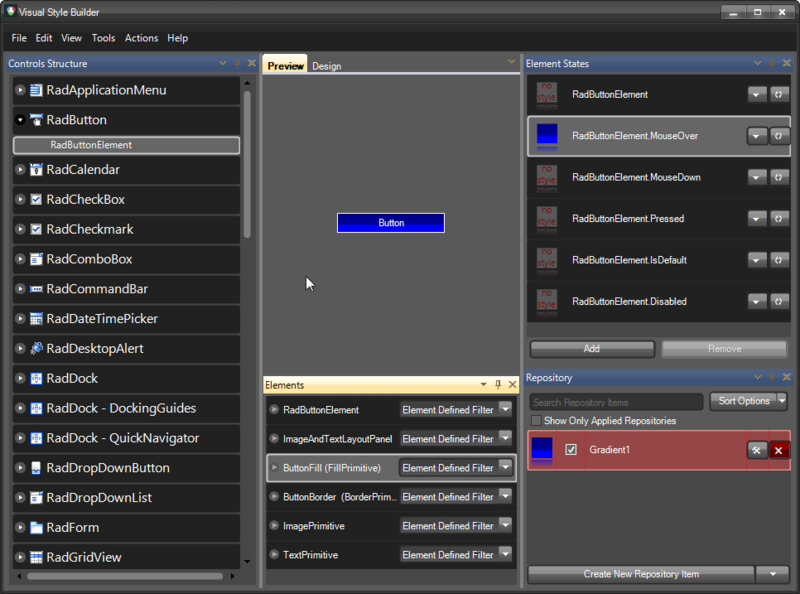 The properties that are not set in the repository item property grid (i.e. they do not have the square indicator) should not be considered as default property values. Only the property grid of the element itself shows the default values. All the property levels can be considered as small particles in one bigger particle – VisualState. 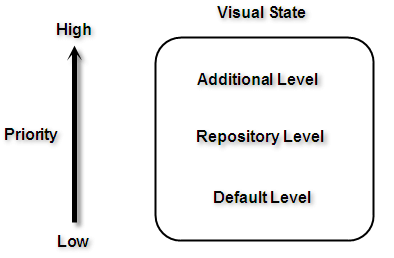 In other words these rules are valid between the property levels in a VisualState. However, since the properties of different VisualStates are set to one and the same element, there is interaction between these properties as well. As it is stated at the beginning of this article, a default property value can be overridden by a custom property value. This rule is valid between the visual states in both directions – i.e. a default property value is overridden by a custom property value and a custom property value is not overridden by a default property value. The properties' values applied for a state are not reset when a control goes to another state. There should be values in the new state which explicitly override the values from the previous state. For example, take the following case – we have a repository item applied to the IsMouseOver state and then we mouse hover and mouse leave the button. However, the button is still blue, even when the mouse pointer is not on the button. This is because the settings of the default visual state (RadButtonElement state) are default and they can’t override the settings provided by the repository item.